The third annual Davis GMC Buick Indoor Super Sale is happening this week at the Cypress Centre in Medicine Hat. From October 25 – 29, over $5 million in new inventory and used inventory is on display and we are ready to make you a great deal. Medicine Hat shoppers can view the Super Sale Flyer to see some of the great deals we have available. Every GM Optimum Certified Used Vehicle has been reduced to sell. No credit application will be refused. There is lots to see at the sale so come to the Cypress Centre at 2055 21 Av SE in Medicine Hat to view everything we have to offer. This incredible sale ends Saturday at 5 p.m. so don’t miss us. Our Super Sale extended hours are Tuesday t0 Friday from 9 a.m. – 8 p.m. and Saturday from 9 a.m. – 5 p.m.
Let Jared Ford take you on a Video Tour of the Cypress Centre Sale. 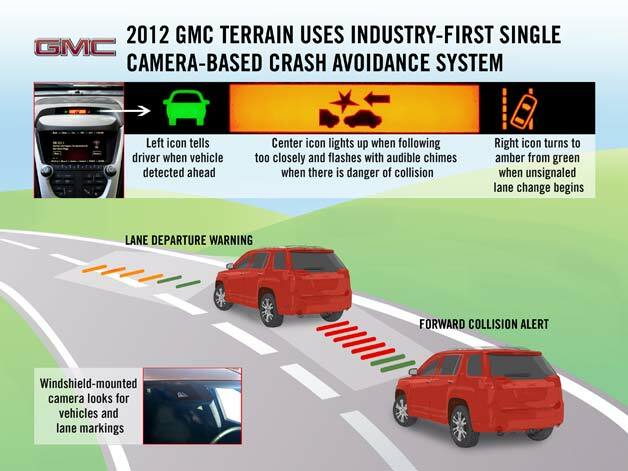 If you’re in the market for a 2012 GMC Terrain, there’s a new option you might find on your build sheet – a single camera collision avoidance system. It is the industry’s first crash avoidance system that exclusively uses a single camera to help drivers avoid front-end and unsignalled lane departure crashes. Terrain’s new active safety system uses a high-resolution digital camera mounted on the windshield ahead of the rearview mirror that looks for shapes of vehicles and lane markings. The system uses audible warnings and a high-mounted visual display to warn the driver if he or she is following another vehicle too closely, when a collision is imminent, or when departing a lane without signaling first. Terrain’s warning display contains green “vehicle ahead” and “lanes detected” icons, as well as flashing red “forward collision alert” and amber “lane departure warning” icons that are accompanied by warning chimes. Forward collision alert operates at speeds above 25 mph and warns a driver if they are following too closely or in imminent danger of a front-end crash. When a collision is predicted to be imminent, vehicle brakes are pre-charged to help drivers quickly reach maximum braking. The forward collision warning software examines each frame captured by the camera – about 14 frames per second – searching for shapes characteristic of vehicles. Detected vehicles are then checked over successive frames for changes in size for calculating time-to-collision. The system also uses speed, directional change, and how the accelerator and brake pedal have been applied to determine when to alert the driver. In order to operate in varying visibility conditions, the system combines four separate exposures to create each high-resolution image for analysis. This is particularly useful at night when short exposures are needed to get clear images of light sources while long exposures are needed to detect shapes and textures. Night time target recognition is also enhanced by looking for pairs of lights moving together that indicate taillights. The system operates as long as the camera eye is unobstructed, such as by snow or mud. In addition to searching for other vehicles, the image processor also looks for lane markings to provide lane departure alerts. Available at speeds above 35 mph, the lane departure warning icon shines green when lane markings are detected to indicate the system is active. If the vehicle drifts out of the lane without a turn signal, the lamp switches to flashing amber and is augmented by warning beeps.